You can probably tell by now (if you check my blog on any kind of semi-regular basis) that I love to stir fry. All of the world’s evils can be corrected with a wok, tofu, vegetables, and some rip-off Chinese sauce. I’m normally pretty boring and make the garlic sauce 5 out of 6 times (it’s just that good! and easy! ), but I decided to splurge and cook the poet something different for a celebratory “you just got through your first day back to teaching” meal. Since I’d been grocery shopping at the Dekalb Farmer’s Market fairly recently, I had a lovely head of organic bok choi on hand, as well as several blocks of tofu, and mushrooms. I thought about the sauces I love at Green Sprout (can anyone say garlic broccoli?!?! It’s so addicting) and remembered a tangy orange sauce they serve on certain dishes. The sauce I made isn’t exactly like the one at Green Sprout, but it’s pretty heavenly. I’m heavy on the spices, so if you don’t like spicy food, I’d definitely cut the crushed red pepper down to 1 tsp or less. Combine all of the sauce ingredients in a bowl. Set aside. Dry fry the tofu. I divide to tofu into 2 batches to do this. Once cooked to the way you like it, set aside on a plate to add to the stir-fry later. In a wok, heat up 1-2 tbsp of vegetable oil on medium heat. Add the onion, cook for 6-7 minutes or until the onion turns clear and soft. 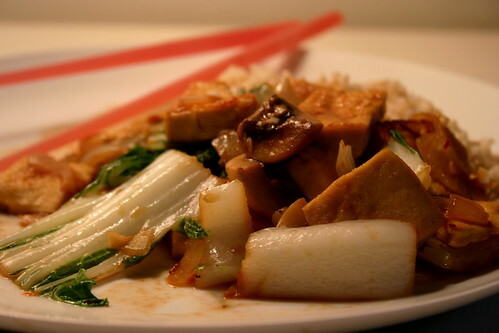 Add the mushrooms and previously cooked tofu. After 3-4 minutes, add the bok choi. Cook everything until tender. Add the sauce to the wok and cook everything for 1-2 minutes. Thanks for the link to that farmer’s market – looks great! garlic sauce can never be boring! Stir fries really are the best- You can just throw everything you’ve got in the fridge into them and it will always be delicious… Well, at least 99% of the time. It sounds (and looks) yummy! I agree with you that stir fry can work some miracles. I can’t wait to try your sauce out next time. Thank you!